February marks 74 years since the internment of Japanese Americans during World War II. The nationwide grassroots campaign to honor the Nisei World War II soldiers with a stamp is kicking into high gear. Supporters want to get the attention of the two people who have the authority to greenlight the stamp: the president and the U.S. postmaster general. The campaign launched an online White House petition on Feb. 19 to coincide with the Day of Remembrance. This petition is part of President Obama’s “We the People” initiative, which began in September 2011 to open up the ability of people to petition the government directly. Past prominent White House petitions include the issues of gun control, legalizing gay marriage, and the right to unlock your own cell phone. The goal will be to get the attention of Obama, who wields authority over the U.S. Postal Service, which is under the Executive Branch of government. There is a precedent of presidents greenlighting past stamps, including Ronald Reagan pushing through the “Hispanic Americans: A Proud Heritage” stamp in 1984. That stamp honored Hispanic American servicemen and servicewomen. The campaign will need to get 100,000 signers within 30 days of inception. If it reaches this number, the White House will typically respond within 60 days. The response is usually from an administration official, but it can be from the president himself. Over 200 online petitions have received White House responses since the website was created. Signing is a simple three-step process. The petition only asks that the signer be 13 or older. The signer must enter his/her name, email, and zip code. The signer’s email address must be verified to complete the signing process. Lastly, the signer is given links to tell others to sign the petition as well, via email, Facebook, or Twitter. To sign the petition, go to the campaign’s social media and main website, www.StampOurStory.org, or its sister site, www.TheyDeserveAStamp.org. There will be links to the petition. In addition to the White House petition, campaigners are working with lawmakers on Capitol Hill to circulate a “Dear Colleague” letter of support for the stamp. The letter will be addressed to Postmaster General Megan Brennan, requesting a meeting to discuss the stamp proposal and urging her approval. This letter is being championed by Rep. Mark Takai of Hawaii’s 1st District. Hawaii is home to the first Nisei soldiers to enlist in the US Army during the war. Rep. Judy Chu of California’s 32nd District is joining him. She is the current chair of the Congressional Asian Pacific American Caucus. Supporters to this cause are being asked to contact their members of Congress members to sign on to the letter this month. If the letter is successful, Takai and Chu will meet with Brennan this spring and urge her to issue the stamp soon. The campaign hopes that pressure on both the president and the postmaster general will lead to a stamp next year to coincide with the 75th anniversary of Executive Order 9066, which authorized the internment. The USPS likes to issue stamps on key anniversaries of events. The USPS only accepts stamp subject proposals, not stamp designs or artwork. If successful, the campaign will likely either see a stamp that directly depicts Nisei World War II soldiers, or a stamp that features the National Japanese American Memorial to Patriotism During World War II. 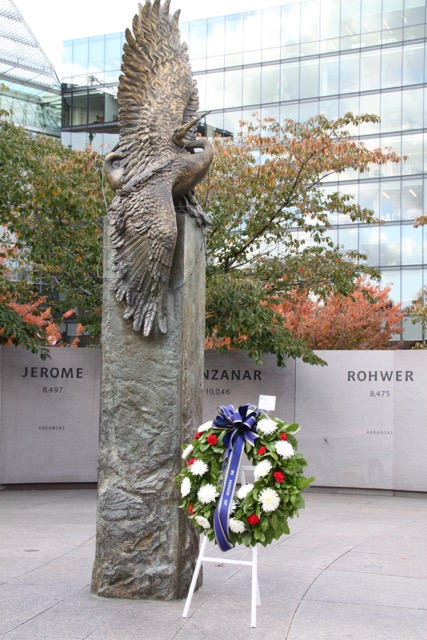 The latter is located in Washington, D.C. and features the story of the Japanese American men and women who served in the U.S. military during World War II. It includes the story of the internment, listing the names of the ten main camps and the number incarcerated at each camp. A prominent sculpture that shows two cranes escaping from barbed wire is the memorial’s centerpiece. Inscribed nearby are the names of the approximately 800 who were killed in action.